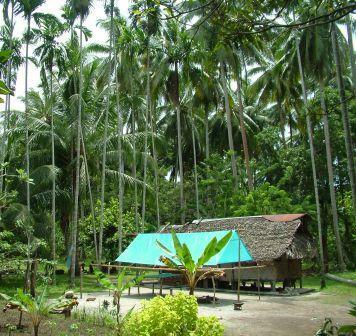 We spent five weeks in a small coastal village named Simbini in the northern part of the Madang Province. We were about a 5 minute walk away from a beautiful white sand beach. Taking a dip in the ocean was a great way to cool off in the middle of the day. We so enjoyed our time there, thought the living conditions were not quite what we are used to. We were able to make ourselves quite comfortable. Since our place was so small we put up the blue tarp and built a table with benches to give us a place where we could visit with our neighbors and share a meal which we did nearly daily. This would provide with ample opportunity to practice Tok Pisin. Gertrude was able to show the ladies in the village how to bake bread and cakes using a drum oven on an open fire. I (Kevin) also taught a couple of men how to bake banana bread. Coconuts were plentiful I made use of coconut milk instead of powdered milk. Everyone made us feel quite welcomed and were very generous. Nearly everyday someone will come by to give us fish, vegetables or fruit from their gardens.